HIDIN’, originally uploaded by Photocoyote. Since its inception, Seattle transit app OneBusAway has been the kind of service you’d have to pry off someone’s home screen. Given King County Metro’s chronic funding shortfalls that keep route schedules from being updated (or even available) at all stops, and the system’s tendency tobog down in rush-hour traffic congestion, OneBusAway’s real-time bus tracking is an essential part of a commuter’s toolkit. …better and additional types of transit information (such as alerts, real-time replanning, vehicle capacity information, and others), integrating incentives for transit use with OneBusAway, crowd sourcing the detection and resolution of data problems with real-time transit data, and providing tools that seek to benefit all riders, including blind and low-vision, mobility impaired, and others. By mid-2011, when Brian Ferris, one of OneBusAway’s creators, was leaving for grüner Google pastures, 50,000 people were using OneBusAway each week. Two years later, that number has more than doubled, to more than 100,000 people. That kind of usage has hardened the app in ways that the WhichBus team can’t match, as of yet. During their beta, they relied upon a pool of 1,200 people who were willing to put up with odd results. The idea behind WhichBus — which you can see on the minimalist home screen — is that transit is about getting from A to B, not memorizing routes, service intervals, or connections. All the site asks is where you are (type in a location, or let it find you automatically) and where you want to go. You can be precise (street address) or not (“Green Lake”), and it churns out route options for you, with real-time info baked in. 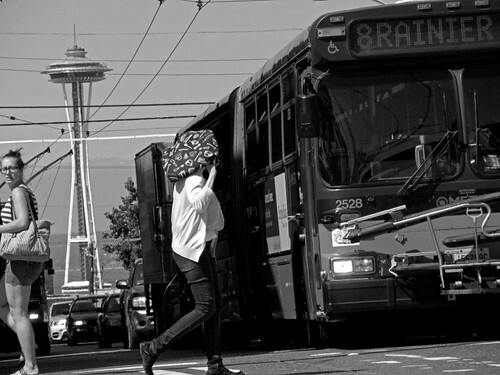 Simplicity has its drawbacks, in a city like Seattle, which maintains an “it’s complicated” relationship with transit. Back in January, I asked WhichBus how to get from Capitol Hill to the University Village Apple Store, which was not just a joke at the expense of hipsters but a difficult problem because the Village is not well-served by transit. Then, WhichBus directed me downtown and out to Northgate. It still does, for a one-hour-and-51-minute trip. Google Maps suggests the three-mile drive should take 10 minutes. The SunBreak is an online magazine of news & culture — a conversation about the things on Seattle’s mind. WhichBus is a CHS advertiser. This entry was posted in News, etc., The SunBreak and tagged transit by mvb. Bookmark the permalink. Another advantage of OBA versus Whichbus is that OBA has regular telephone access to arrivals (456-0609) where WhichBus does not appear to have telephone access. If you don’t have a data plan (or even a smartphone) that’s a decided advantage. I use OBA and Google Maps in tandem. I’m comfortable with my technique, but sometimes it can get confusing. I welcome any app which combines directions with real time info. However, like the article suggests, I am skeptical that a developer who is new to the scene can deliver the goods. Count me among those very skeptical of the Sound Transit takeover of the app. Was there no option to just extend the contract with the experts? Sound Transit is not taking over the app, they’re taking over the servers that supply the data to it. The apps will continue to be developed and maintained by the same people (volunteers as far as I know) who are already working on them.